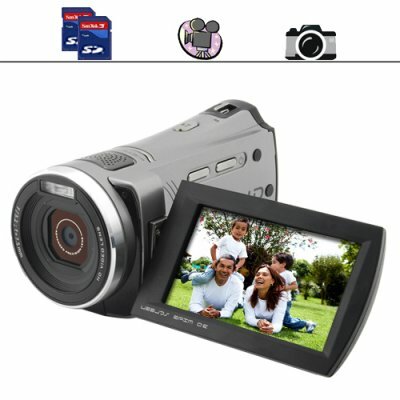 Successfully Added Family HD Camcorder with 3 Inch Screen + Dual SD Card Slots to your Shopping Cart. The latest in our famous DV1 series Hi-Def camcorders, the DV15 Family HD Camcorder is specifically designed for those people who want a digital video camera with everyday use features (Movie and Picture Capture, 3 inch Widescreen Display, HDMI and AV connections, All Cables and Carrying Case included) that any beginning or intermediate user can appreciate and use right away. If all that wasn't enough, the Family HD Camcorder also has a big 3 inch flip out LCD rotating viewscreen that will help you in easily capturing all the action and adventures that are going on around you. Then when you are done recording your videos and pictures, simply hook up the camcorder to your TV via the included HDMI or AV cable to review the high-def footage on your big screen TV or take out the SD card(s) you recorded onto and you can view the computer friendly movie and photo files right on your computer. Whether you are buying this as your very first digital video camera or you are a long time user of camcorders, you are going to find plenty of features to love in our CVGT-DV15 Family HD Camcorder. Better still, like all the videocameras in our DV1 series, this OEM camcorder is in stock in our warehouse right now and is being offered at a factory-direct low wholesale price. So stop missing out on the chance to record those precious moments, click "Add to Cart" right now to purchase this great video camera and we will ship out this in-stock product to you tomorrow! The included CD has the user manual in pdf format, Apple Quicktime, and Web Camera driver for Windows PC's. If you are interested in editing your videos or photos then open source software such as Gimp will be a good choice. In addition, open-source software usually has better language choices and operating system compatibility than what is included with the camera. What makes this model DV camera better than others on the market today? Aside from the low wholesale price there are two primary reasons - (1) hand held design allows quick and easy thumb control of the recording process for any sized hand (2) simple controls means there is no learning curve, just turn it on and go! The DV1 series is a particular favorite with young families and video bloggers.